Rise above the frenzy of the Strip at one of Las Vegas’ premier attractions with amazing views. Eiffel Tower at Paris Las Vegas tickets are available for purchase right here with Vegas (the app). An icon of the city skyline, the high-altitude attraction is located 46 stories up and is a half scale replica of the world-famous Paris, France landmark. The observation deck features 360 degree city views and knowledgeable Ambassadors point out Las Vegas landmarks. A popular spot for weddings, the Eiffel Tower Viewing Deck is especially romantic at night. The views of the bright, colorful lights and the lit water show are unmatched. Double the romance with dinner a few stories down at the 11th floor Eiffel Tower Restaurant. 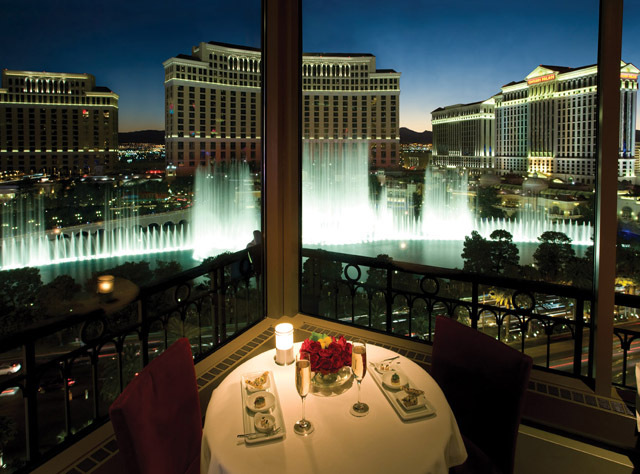 Experience the breathtaking view from the single most romantic spot in all of Las Vegas. A signature of the Las Vegas skyline and one of the best things to do in Las Vegas, the Eiffel Tower Ride at Paris Las Vegas is a replica of one of Europe's most famous landmarks. This Las Vegas attraction is located in the heart of the Las Vegas Strip, 46 stories above the city. On your journey to the observation deck of the Eiffel Tower Ride, our knowledgeable Ambassadors will point out unforgettable Las Vegas landmarks. Once on the observation deck, you will encounter a breathtaking 360 degree view of the Las Vegas Valley. The venue reserves the right to implement security procedures designed to protect the experience for our customers. EXPERT TIPS: Exhilarating, adrenaline-charged glass elevator ride up 460 feet. Experience a breathtaking 360-degree city view. Many optimal photo opportunities in a Dreamy setting among the nighttime lights of the Las Vegas Strip.The Eiffel Tower observation deck is just a quick lift up from Eiffel Tower Restaurant. Children 3 and under are free with a paid adult admission.